Step back in time to the 1700s - an age of discovery propelled by silk sails, wooden ships and burgeoning seafaring technology. 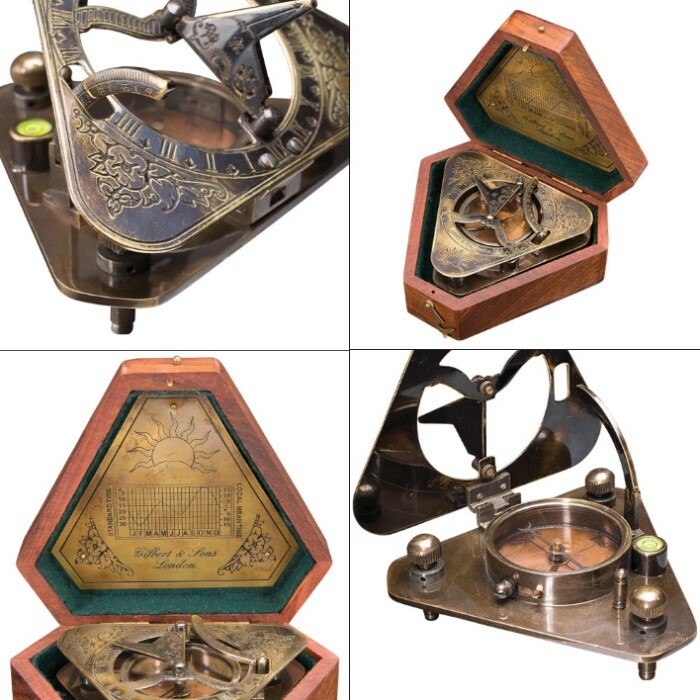 You're a navigator on the high seas, attempting to chart a course to unknown lands using one of these new groundbreaking devices - a small brass sundial compass etched with various numbers, graphs and cryptic markings. 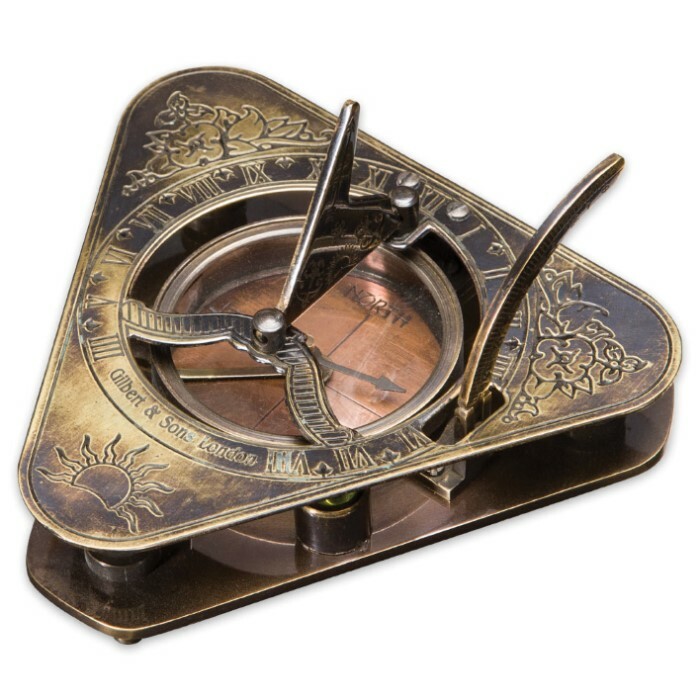 Primitive, though they may be, sundial compasses like this striking replica were indispensable in traveling to and even discovering far off locales like Australia, countless small Pacific islands and of course our home - the Americas. That's because time and direction are crucial in pinpointing one's location on a vast, unchanging ocean. 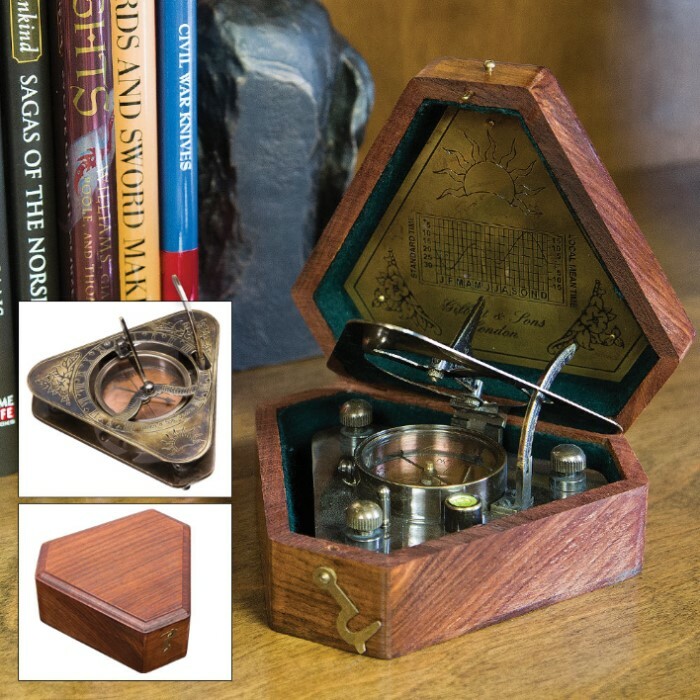 This gorgeous antiquated sundial compass is a reproduction of a circa-1750 compass left behind on Roger's Isle by the legendary green uniformed Rogers' Rangers. A British provincial company that fought the French in the Seven Years War (aka French and Indian War), Rogers' Rangers would have relied on this fine handcrafted instrument to navigate the uncharted coastline of the New Hampshire colony during that infamous conflict. Our version is loaded with historically faithful details like ornamental floral etchings, a time graph, flip-up protractor and "Gilbert & Sons London" makers mark. Housed in its handsome felt-lined wooden display case, this 4" historical treasure looks great on any mantle, side table, bookshelf or practically anywhere else. It also makes a great gift for history buffs, antique navigational tool collectors or anyone who appreciates fine vintage decor. This is an excellent navigation tool, a must have on ships before the 20th Century, the compass is of the highest quality. The combination of a compass and sun-dial is very well made, and the high quality box looks like Walnut. Being a Navy Vet I'm very impressed with this most useful Treasure. Thank you. BudK.